I am the gifted and talented coordinator for my district. In a larger district this would be a full-time position spending more time testing kids and placing them in programs. In a district of my size, however, it means that on top of being a full-time teacher I am also testing, identifying, and running these programs. But I digress. I love my job and I love that I get to do all the extras like the science club and the newspaper. Having a school or classroom newspaper is a great activity for reaching all kinds of kids, informing parents and the community, and promoting your classroom and your school. However, the main roadblock to making a newspaper is the important layout stage. Once you have all the written work from the kids, how do you put it together? Do you copy and paste it into Word? What if Billy’s piece on mystery meat is too long or too short? How does he know it has to be longer? When you have to manage 30 students, all writing different things, all saving to different files, it soon seems to become more trouble than it’s worth. Enter Google Documents (Google Docs), my favorite (and free) cloud application. With Google Docs, it is possible for students to work on the same document—at the same time. It just takes a little bit of setup and a little bit of student training. 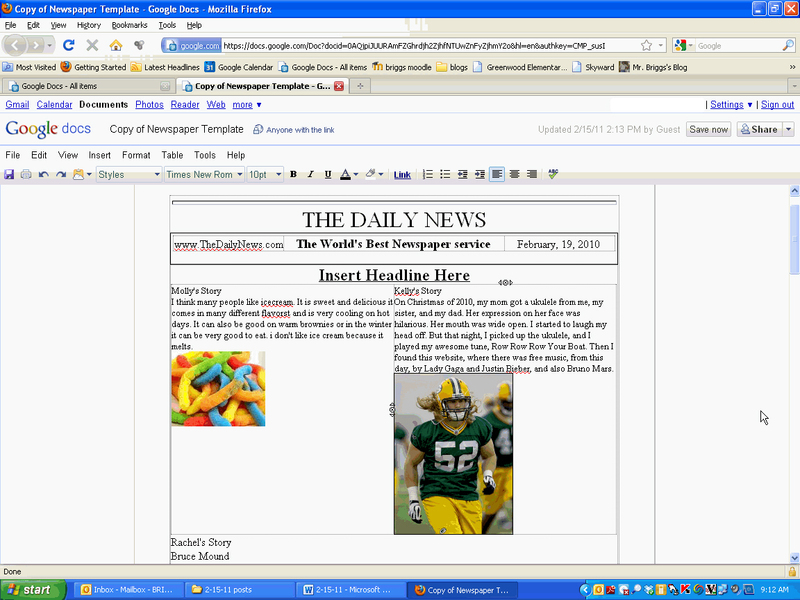 Here’s how you can create a classroom newspaper on Google Docs. Create a ‘blank’ newspaper layout using tables; decide how many columns you want, how many pictures and so on. Be careful, because a Google Doc does not like to include page breaks—you don’t want your column cut in half. Put your student’s names into the cell you want them to write in. Set up Google Docs sharing so that anyone can see this document and edit it if they have the link. Give the students the link, I would be careful about this because anyone who has this link can anonymously change it, I like to put it on my Moodle, so that students have to log in to access the link, and at the very least I can go back to the Moodle login records if someone messes with the document. The best option for security purposes would be to be part of Google Docs education, and add your students, that way you know who did what to the document. Let the students fill their “cells” with their writing. They should be able to not only see their work, but the work of other students, creating a great incentive for students to finish on time and to aid in editing. Tell the students who get done early to start fixing their classmates’ columns. What is really great about this is not just having students working on the same “page” as one another, but also that you, as the teacher, can go right from assigning the project to printing it without much hassle. Want to publish on the web too? Google Documents lets you publish the document as a web page, making it a read-only web page that you can link to your blog or email to parents.